This is a blanket that I make very often. I have never had a pattern until I wrote this one! 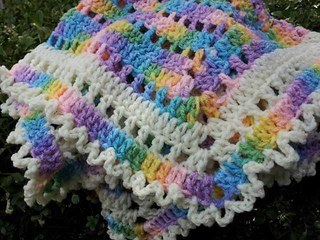 The blanket is the perfect size for Preemies, small newborns or reborn baby dolls. It measures approximately 22 x 22 inches. 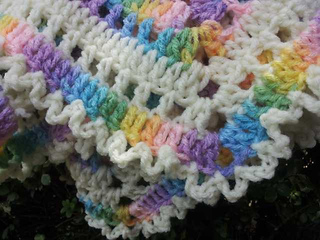 The pattern is beginner level and takes very little yarn to complete. Just around 7-8 ounces will finish this blanket. (When using a G Hook) It may take up to 10 ounces depending on the hook size. Once you get the hang of making this blanket, it can be modified many different ways and made in so many different color combinations.